Will holidays ever be the same? We traveled to Hanoi for a two-week holiday, to visit our son and have a relaxing break taking in a country and culture totally new to both of us. On being picked up at the airport by Duncan the "relaxing" bit of the holiday quickly went out of the window as he informed us that he had organized a five day trip into the hills traveling on motorbikes, with only one day to settle in. 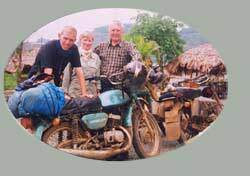 With neither of us having ever been on a motorbike, never mind traveling for 500 km through some pretty rough terrain, we were a little apprehensive but had no hesitation in looking forward to the trip. Five people including our leader and Duncan's friend from university, Tuan set off on what was to become a memorable trip. Although not an expert I did happen to notice that these Russian 'Minsk' bikes looked a little different from the sleek, streamlined and colorful machines that pass me at speed in the UK. However we soon realized that traveling in Vietnam requires a very special type of machine, particularly when the mud is up to the footrests and in other cases when quick repairs are required. This was to be clearly demonstrated later in the lour. When we look back at our photographs of Cuc Phuong, Mai Chau and the mountain passes over which we traveled we pinch ourselves and ask whether it all really happened. We rounded off our holiday with a 3-day coach and boat trip to Cat Ba Island which was both beautiful and relaxing. Our eternal thanks to all involved in the trip, and the highest recommendation to anyone considering a similar one.